"It's extremely exciting to win considering what it's for! Mickey Mouse is so iconic, the world over. It's also extremely exciting to have been nominated along a group of such world-class talents at Disney." says Graham who claimed his Emmy alongside Disney Television Animation's Paul Rudish (Executive Producer, Director & Writer), Derek Dessier (Writer), Clay Morrow (Writer) and Aaron Springer (Writer). "I could not have done it without Mercury Filmworks' amazing and dedicated crew. I simply would not have won without them. They deserve as many accolades." states MacDonald in regards to the team who helped bring the project's much regarded retro style to life. This marks Graham's second official Emmy nomination (the first being for Toot and Puddle in 2011) and his first official win. Mercury Filmworks wishes to congratulate Graham MacDonald, our fellow Disney Television Animation nominees as well as the crew who made this win possible and who consistently pour themselves into their work and, time and again, exceed that benchmark in quality for which Mercury Filmworks is extremely well-known. 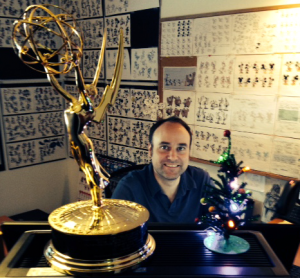 "O Sole Minnie" also won an Emmy for Outstanding Individual Achievement in Animation.